My affinity with moss spans a long time period and might continue forever! Moss is just the material most closest to earth and the serenity around it never ceases to touch my heart. Zinnia, smoke tree and fresh moss. From one of my lessons. Glass on moss. Moss is just the always perfect background for anything. Anything with a contrast, to say correctly. From my lessons. As said, contrasts are needed. Metallic accents fit very well to the texture and color of moss. British House, Yokohama. Preserved moss. British House, Yokohama. The Komorebi table up in the forests in Sweden is maybe my biggest solo project so far. Fresh moss outdoors is the best table decoration ever and in this living project it stays there hopefully forever. Preserved moss. British House Yokohama. Natural moss has quite a dark green quality. Christmas fir tree Green. These are the zabutons for kneeling at the Komorebi table. Fresh grass has a similar effect to moss: the calming, soothing effect of the color which surrounds us on this planet: GREEN. I am a big fan of the NCS, Natural Color System Sweden, as they call green the “4th fundamental basic color”. Finally! 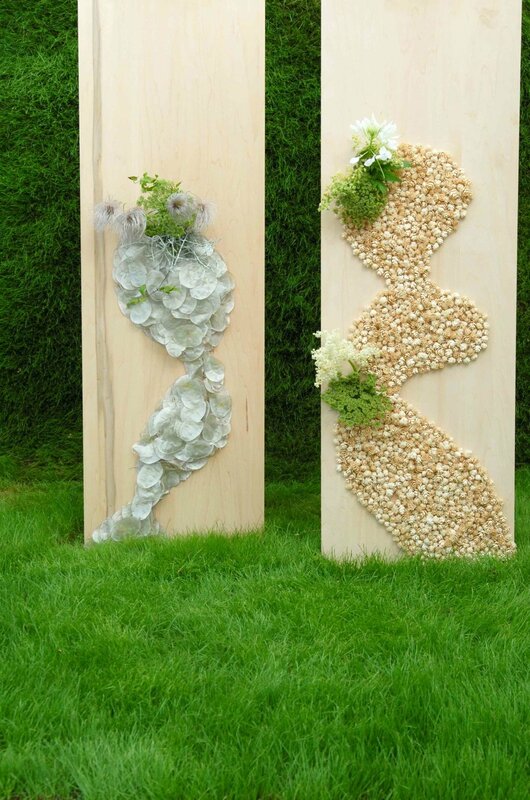 I am trying to add real grass to my flower arrangements to “naturalize” them. Or I am adding other “grassy” green cut flowers to reach the same expression. Fresh grass, which I grow out of turfs. The light green and the detailedness of the grass render normal carnations into meadow flowers. The dancing figures. Left is a body out of Lunaria, right out of little Sugi cones. The “Green Mist”, a kind of wild carrot, corresponds with the green turf mats. They were seeded and grown in my friend Lydia’s greenhouse especially for the photoshooting. 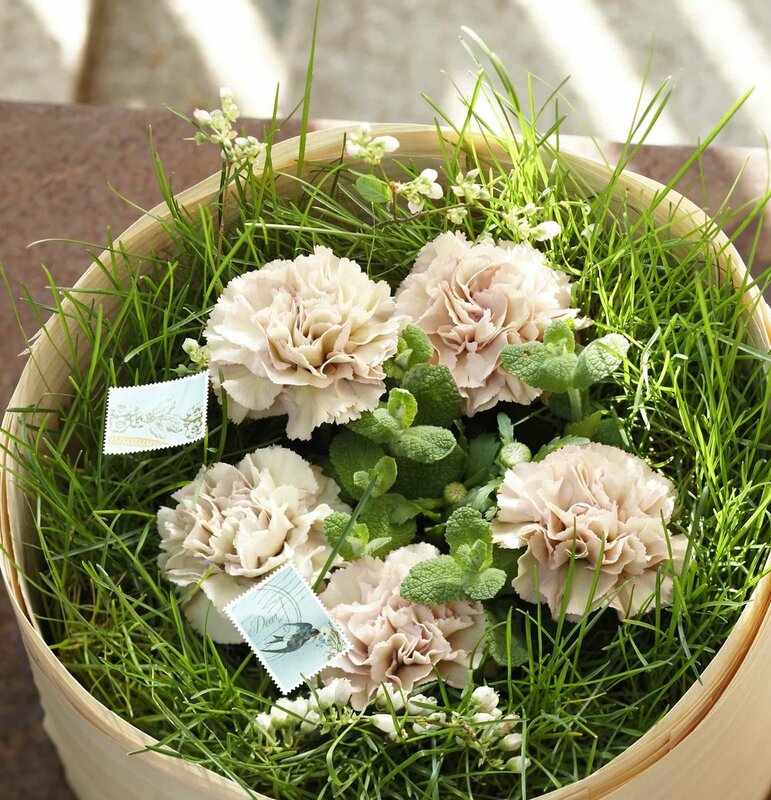 For bouquets, to create the green atmosphere, I use the “moss carnation”, “temari” in Japanese and dry grasses. From my lessons. Light green grass always enhances light blue colors. The blue is already a fleeting color, the Hordeum grasses make it feel even lighter, adding a feathery aspect.